Preparation: In a tagine, arrange the zucchinis, washed and diced. Add the sliced onions and the shallots, peeled. Peel the tomatoes, remove the pips and dice. Crush the garlic. Remove the head from the washed okra. Cut the pepper into slices. Add salt, pepper, coloring and the beef stock cube.Place broiled meat. Decorate with the pieces of meat and green peppers. Sprinkle with parsley and add a little water. Cover and simmer for around 35 minutes. Check cooking and add water if necessary. Serve hot. In a pressure cooker, lightly fry the mat portions in oil. Add the crushed garlic, one-quarter of the diced onions, the beef stock cube, the ginger, the salt and the two strands of saffron. Cover with water and boil on a high gas until the pressure cooker starts to whistle. Then lower the heat and simmer until the meat in cooked. Remove the meat once cooked. Put two saucepans of stock by to cook the prunes. Add the remaining sliced onions. Simmer until the onions are tender. Reduce the stock if necessary. In another pan, place the stock put aside from cooking. Add salt and pepper and the washed prunes. Simmer until tender and add the sugar, cinnamon and the honey. In a frying pan, saute the almonds, boiled and peeled. Remove from oil and dry. In another frying pan, gently fry the sesame grains without oil. Place olive oil in a saucepan and add the meat. Heat to boiling point just before serving. In a 40 cm diameter plate, place the portions of meat and , on top the onions and the sauce. Decorate with prunes fried in sesame and the almonds. 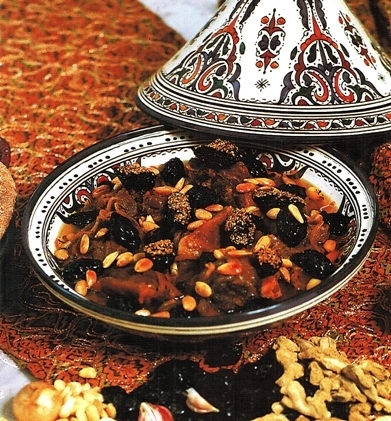 (Moroccan Recipe from “Traditional cuisine of Morocco” By Alami Talbi Othman). In a pan, cook chicken with the spices and the oil for 10 minutes. Add the onions and fry. Cover with water and simmer until meat is cooked. Check water level and add more if necessary.Remove the chicken, add the carrots, chicken stock, lemon and parsley; simmer. At the last moment, add chicken to heat with the olive oil. Serve in 40 cm diameter plate and decorate with the red olives. One of the most loved “sweet and savory” Moroccan recipes. 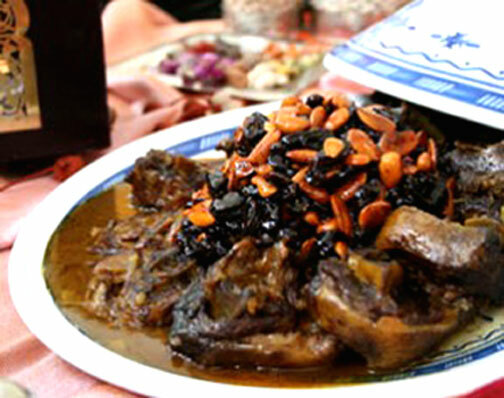 It’s a Tagine prepared mainly with lamb, raisins, almonds, honey, and Ras el hanout, served mostly for holidays and special gatherings. Ras el Hanout remains the key spice mixture in m’rouzia and is responsible for its unique taste. Over medium heat, without preheating, melt the butter in a tagine vessel, add the meat, onions, garlic, and seasoning mixture. Mix, add water, cover and let cook for about 2 hours or until the meat is tender (add water as necessary). When the meat is cooked, add raisins, honey, and some ground cinnamon, cover for another 20 to 30 minutes stirring constantly until the sauce is reduced to thick, viscous syrup. 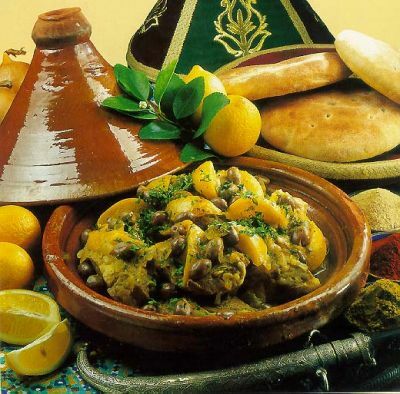 Serve in the same tagine, trying to arrange the meat in the bottom and the raisins on top. Add the almonds as a garnish. 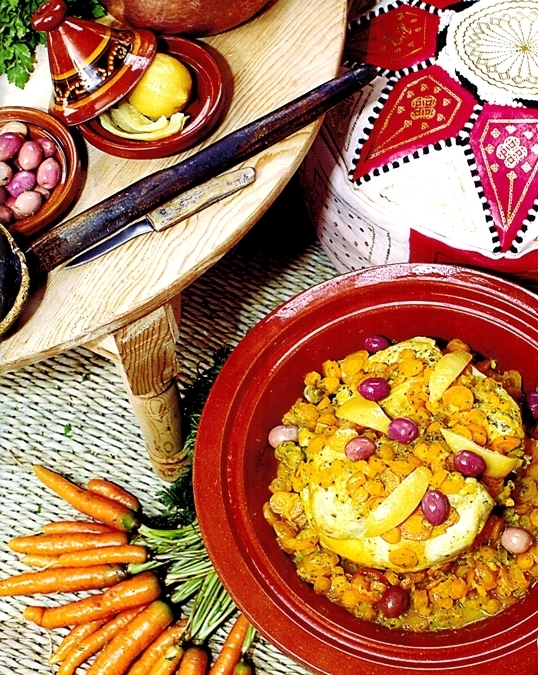 The MROUZIA can also be cooked in a pressure cooker then served in a beautiful serving tagine. Mix all the spices with lemon juice, minced garlic, cilantro, parsley and ¼ of preserved lemon cut into extra small pieces. Rub the chicken with the mixture and set aside for 30 minutes to marinate. In a tagine over low to medium heat, warm the oil, add onions and cook stirring until soft. Nicely arrange the chicken pieces, add the rest of the rub, water, cover and cook for 25 min or until chicken is tender. Remove chicken and set aside. Bring sauce to boil, stirring continuously until thickened. Put the chicken back into the tagine, pour some sauce on top, then garnish with preserved lemon slices, green olives and some parsley. Cover and cook for 5 more minutes then serve hot directly in tagine. This tagine is usually served with the fresh and delicious Moroccan bread (I will give you the recipe in a coming post).